Small businesses, especially in rural areas, can struggle with keeping customers loyal when big box and chain stores are opening in the nearest major city. Competing can be tough, but social media for small business can give you the edge that you are looking for. Consider the example of a small, locally owned coffee shop competing with a newly installed Starbucks. Here are a few quirky tips using social media for small business to make the local coffee shop seem like a much more interesting option than the popular chain. Offer free wifi and let customers Twitter their orders. Imagine it. Customers come into the shop to chat or work, and from their phones and laptops, can place orders without worry of losing their seat or disturbing the conversation. Regular customers stopping in on their way to work can Twitter their order before arrival and have it ready to go when they get there. Social media for small business offers convenience that the big chains simply can’t. Run a coffee shop blog and allow visitors to contribute. Set up a free blog with a guest account. Services like WordPress allow you to moderate posts before they go live. Encourage your patrons to post about the coffee shop, compose poems, or simply express themselves freely. Put a “secret password” up on Twitter every afternoon and encourage people to come in for a coffee happy hour. Those with the password can receive discounts, a free pastry or an entry into a happy hour drawing. Feature your favorite tweet of the day up on your menu board. Name a drink after one of your Twitter followers for the day. Enter each of your Twitter followers into a drawing to be the “Follower of the Week,” entitling them to one free coffee each day of their reign. These are just a few quirky and creative ways social media for small business can be used to set the local guys ahead of the big brand players. These types of ideas can be applied to any type of local business. Take your time to think up a few ways that social media will allow you to offer benefits and services to your customers that the big guys can’t. Do you visit coffee shops as regularly as I do? 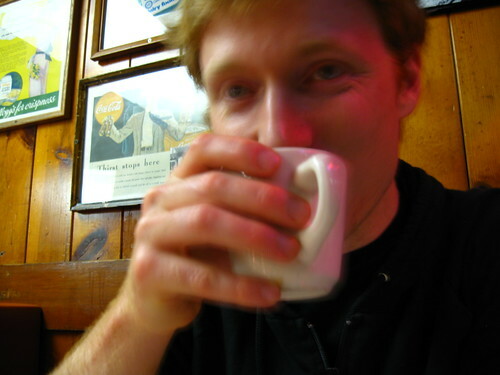 I think you will enjoy learning more about “Caffeinated Conversations.” I met Jason from Caffinated Conversations on Twitter a couple of weeks ago and I have found his blog fascinating. Striking up, facilitating, capturing, and collecting conversations at coffee shops, coffee houses, cafés, and other conversation friendly places. It’s funny how people separate the social aspects of their “real” lives (such as going for coffee, heading out after work on a Friday for drink, etc.) and their “social network” lives. I guess that’s the purpose of meet-ups and tweet-ups, but it would be awesome if business became the conduit for such activities by using the techniques you describe. I’d like to add a suggestion as well. I have this wonderful espresso machine at home. I can froth milk with adequate results, but I’d surely go to a meet-up / tweet-up sponsored by a local coffee shop that would teach me how to use the machine better. If they did a different type of drink on a monthly basis, I’d most likely go. I’d be apt to stop more often on my way to work/clients, and I’d probably buy my beans there.